Germany’s recent Eurocon was quite small in comparison to recent events in places such as Spain, Sweden, Croatia and Finland. The total attendance was under 300, and seemed to skew towards an old, white male demographic. That was a shame, but nevertheless it ran well and was an enjoyable weekend for those of us who attended. Dortmund is not high on the list of German tourist venues. Razed to the ground by the RAF in WWII, it boasts a modern, mostly pedestrianized city center surrounded by a ring road. The small airport has direct bus links to the railway station which sits on the ring road and is a short walk from several hotels and the convention venue. It was all very convenient. 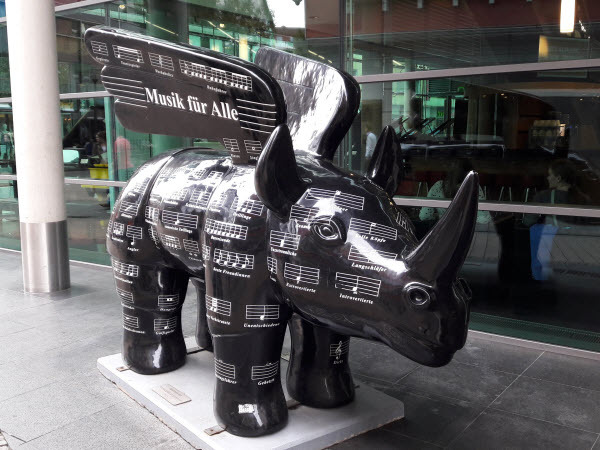 The city seems obsessed with winged rhinos. Not only do they have a large collection scattered around the street, they are also used widely on signs and posters. Apparently the animal is the mascot of the local orchestra. Dortmund’s main tourist attractions are a large soccer museum (reflecting one of the city’s abiding passions), a beer museum (reflecting the other) and a tram museum. 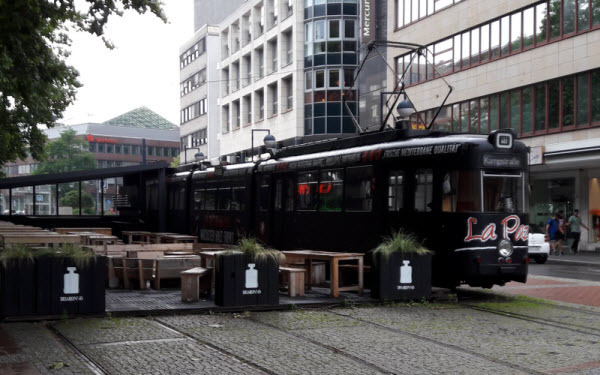 The city’s tram network has been moved underground recently, though part of a line through the center has been preserved, complete with a tram restaurant. The museum was running vehicles on the Sunday and a fair number of British fans disappeared off to see them. Back at the convention, I spent most of my time behind the Worldcon #76 table. We were not expecting to sell many membership, but sometimes it is good just to fly the (bear) flag. Also I wanted to gauge feelings about the convention in Europe. Most people, of course, simply couldn’t afford to go, but of those who could more than half cited fear of the current political regime in the USA as a reason for not attending. I got to see very little programming, but I was delighted to get a chance to listen to my Czech friend, Julie Nováková, hold forth on the subject of icy moons. There is way more water in the solar system than anyone expected, and the possibility for some form life existing on one of those moons is encouragingly high. The Art Guest of Honor was German-based Brit, Autun Purser. In his day job he works with as a deep sea ecologist at the Alfred Wegener Institute in Bremen, doing fun things like photographing life on the sea floor using remote controlled submarines. Julie, as an astrobiologist, and I, as a former oceanographer, we delighted to see some of his footage. To get an idea of the sort of thing Autun does, check out this article in which he is talking about the supremely cute ghost octopus. And of course he does art too. Sadly I didn’t get to see any program items featuring the other Guests of Honor: Aleksandar Žiljak, Andreas Eschbach and Dave Hutchinson. There were a lot of dealers. Thankfully most of the books on sale were in German, so I did not get tempted to buy any. 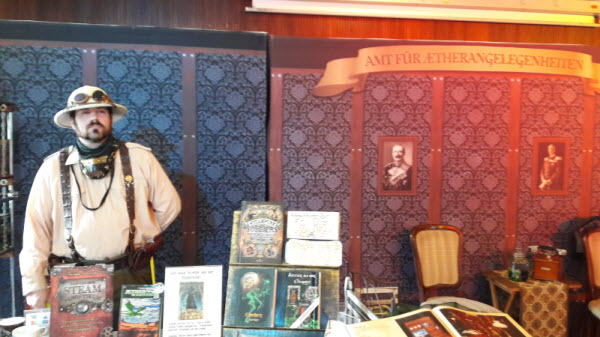 However, I was very impressed by the steampunk group who had a big stall covering one end of the room I was in. Steampunk is clearly a big thing in Germany, and they told me how they tried to avoid any association with Prussians and German imperialism. The Griffin that they use in their arms is the symbol of the Grand Duchy of Baden. A much more suitable hero for a steampunk story might be King Ludwig II of Bavaria, most famous for his fairytale castle but also a keen designer of airships. Which brings me to mention of my new pal, Ju Honisch. She has a lot of big fantasy novels out in German. However, she has one available but unpublished in English which features Ludwig, albeit briefly. You may hear more of this book in the near future. Charlie Stross and I both liked what we heard of it. Ju (pronounced “you”) is also a very fine filker and those of you on the convention filk circuit may have already met her. 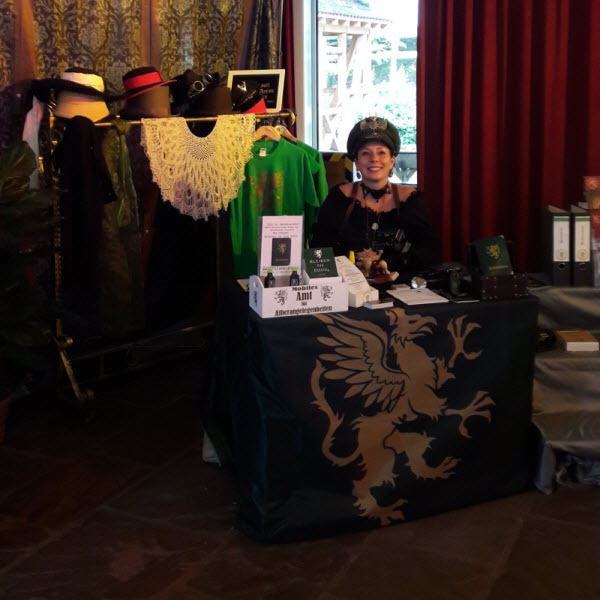 I didn’t manage to get to the Business Meeting as I had a table to manage, but I understand that there was not much business to discuss and the sessions were over very quickly. Efficient meetings are appreciated by all. The ESFS Awards were given out on Saturday evening. Many of them are encouragement awards for up and coming talent, so I don’t expect to know their work. One may be known to you, however. 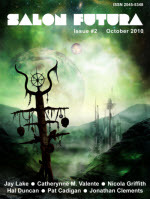 Hanuš Sainer is a talented Czech writer, one of whose stories, translated by Julie, has appeared in Strange Horizons. In the career awards I was pleased to see some recognition for Judith Clute. Ian Watson, having staged a very successful Eurocon in Barcelona last year, was given the Best Promoter award (which he rightly said he was sharing with his Spanish wife, Christina). This year’s Hall of Fame award went to Serbia’s Zoran Živković, and about time too. 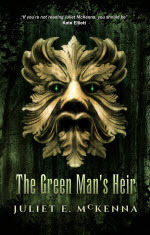 Incidentally, all of Zoran’s work is in the process of being reprinted in beautiful new editions. See here for details. That was Eurocon done for another year. In 2018 we will be in Amiens in France, a city that was home to Jules Verne for most of his writing career. The easiest way to get there is by train, either from Paris, or Eurostar to Lille if you are coming from the UK or Belgium. In 2019 the Eurocon will be in Belfast, hopefully the weekend after the Dublin Worldcon if all goes according to plan. Rijeka in Croatia is still unopposed for 2020. My thanks to Ju & Jela Schmidt who were great company in the dealers’ room, to the Ukrainians for the honey-chili vodka, to the convention committee, to the kind people who transported Worldcon #76 materials back and fore for me, to Fluff Cthulhu for refraining from eating me, and to all of the fine folks who made it such a lovely weekend. I still owe you a beer or two, Christina. 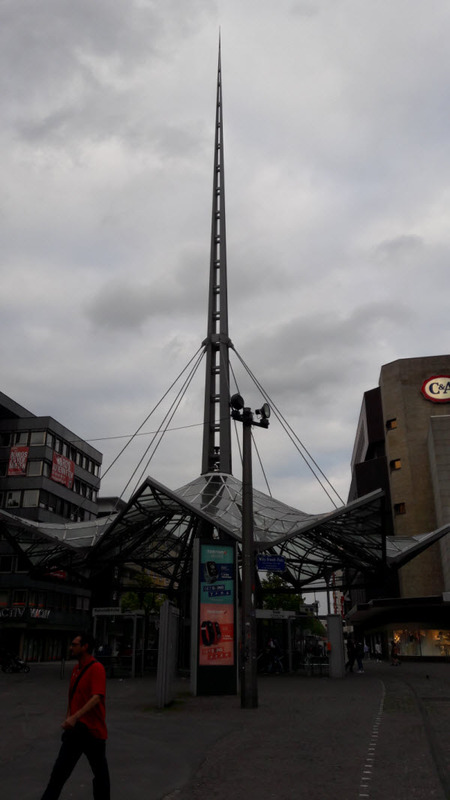 My final picture is the most science-fictional thing in Dortmund, the space elevator. 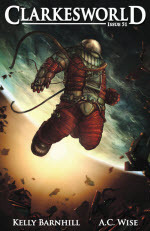 This entry was posted in Art, Awards, Conventions, Nature, Science Fiction. Bookmark the permalink. If my recent experience of the return trip from Paris on the Eurostar is anything to go by, I would not recommend this mode of travel. Apart from the inside of the train not being cleaned, the crazy system of having to go up the stairs to check-in and then down the stairs to the trains, the carriage numbers not aligning with the doors, the lateness of the train,…. I think I had better stop now, but you get the picture. I do, but the alternative is to fly to Charles de Gaulle Paris and either drive 63 miles or head into town and get a train there. It was nice meeting you again, though I guess we just did on the party the day before. And well, more or less my experience, a bit more exciting for me, as my mother tongue is German, so I am dealing a lot with the German fans. Did you do some sight-seeing? – I did not a lot, but I have at least been to the beer museum. Very interesting and steampunky! It was great meeting you again too, Nina. Sadly I got almost no tourism done, as I had the table to staff by myself. The Museum für Kunst was right by my hotel and looked interesting, but I didn’t get to go in.